The U.S. economy remains on solid footing and by summer this year is expected to surpass the longest economic expansion in history, and the 120-month mark set from March of 1991 to March of 2001. Even so, it seems we are trying to talk ourselves into a recession, with frequent media reports variously titled “The recession, when will it strike?” Yet no one bothers to remind us that Australia is entering its 29th consecutive year without two consecutive quarters of negative economic growth, otherwise known as a recession. Economic expansions don’t stop from fatigue – something must cause them. The Nasdaq Composite Index inched toward exiting the bear market in entered on Christmas Eve, rebounding nearly 20 percent to a Feb. 8 close of 7288.24. It would have to reach 7431.50 to make it official, and if it does, it would be its second-fastest exit from bear marketing territory in history. The rally was led by the FAANG stocks of Facebook, Apple, Amazon, Netflix and Google. Turning to the property markets, strong Q4 activity pushed 2018 above 2017 for investment volume in the U.S.
Commercial real estate investment volume rose 20.6% year-over-year in Q4 to $152.4 billion. Including entity-level transactions, total investment for the year was $534.8 billion, a sizable increase of 14.8% from 2017. Excluding entity-level transactions, which are highly volatile from year to year and can skew annual comparisons, 2018 investment volume was still up by a healthy 4.9%, according to Real Capital Analytics. Greater New York, Greater Los Angeles and the San Francisco Bay Area attracted the most investment in Q4, accounting for 27.7% of all acquisitions. The top-15 markets accounted for 64.4% of total Q4 investment volume. The only sector with cap rate compression in 2018 was industrial, according to the latest CBRE North America Cap Rate Survey. CBD/infill cap rates increased more than suburban for office, multifamily and hotel. Pricing for office, multifamily and industrial properties reached new highs. Increases in multifamily and industrial pricing led the national index, though the pace of growth for multifamily decelerated in 2018. Broward County added 15,800 net-new jobs during 2018, bringing the Ft. Lauderdale-Pompano Beach-Deerfield Beach MSA to an employment base of 866,300, and with a jobless rate 3.3 percent. Trade, transportation, utilities and professional services led job growth, according to Florida’s Department of Economic Opportunity, Bureau of Labor Market Statistics. Construction (3,300), education and health services (2,100), leisure and hospitality (1,500) were other job sectors that posted gains. However, the county lost 600 financial services jobs and 500 government jobs in 2018. South Florida should receive increased flows of investment capital into commercial real estate as a result of the Tax Cuts and Jobs Act of 2018, according to Miami law firm Berger Singerman and the firm’s fifth annual survey of over 2,000 local real estate professionals and property investors. 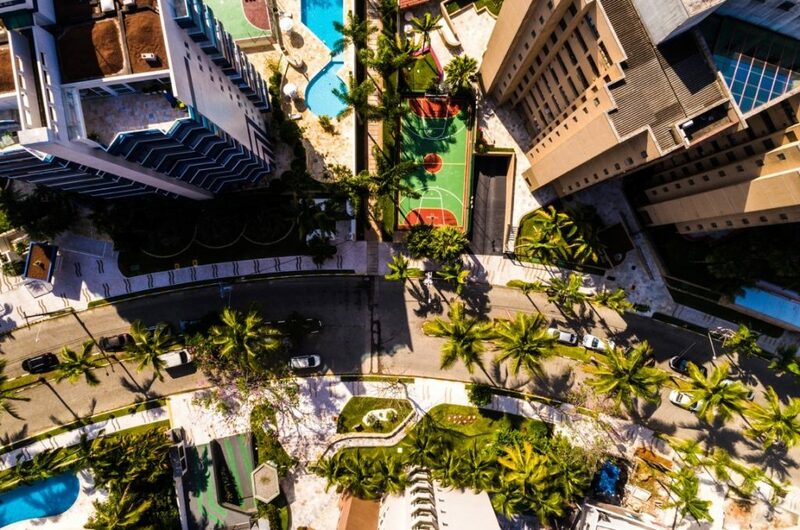 Indeed, the Miami condo market was recently featured in national news as the most likely relocation target for New Yorkers and people from Connecticut. This is the first year that people will be filing tax returns under the new law, and with new limit for SALT deductions (State and Local Taxes) set at $10,000, high-income earners and families with large mortgages are expected to flee high-cost states, including California, where it is not uncommon to pay property taxes of $20,000, $30,000 and even more annually – 100 percent of which was deductible under the old tax rules but won’t be starting this year. Morris Southeast Group represented the worldwide leader in marine propulsion systems, ZF Marine Propulsion Systems Miramar, LLC in a 62,552-square-foot industrial warehouse lease in Miramar. The industrial market led other South Florida property sectors in 2018 (again) by posting 5,149,470 square feet of positive net absorption for the year. The overall vacancy rate stood at an historic low of 3.8 percent at year end, with the average quoted asking rental rate for available space at $10.33 per-square-foot at the end of the fourth quarter. Total industrial inventory in the South Florida market amounted to nearly 439 million square feet, or about the same size at Boston’s industrial market. Total industrial building sales declined on a year-over-year basis and through the first three quarters of 2018, with 167 buildings of 15,000 square feet or larger traded hands, for a total volume of $1,051,381,525, according to CoStar. That compares with 171 building sales in the first three quarters of 2017 with a total volume in excess of $1.3 billion. Cap rates compressed during the year, falling from 7.18 percent in 2017 to 6.59 percent in 2018. At the close of the year, over 7.4 million square feet of industrial property was under construction, led by North Miami Beach industrial submarket (1.75 million square feet), Miami Airport (1.09 million square feet) and Southwest Broward County (1.07 million square feet). The South Florida office market was stable during 2018 and ended the year with an overall vacancy rate of 9.1 percent on tepid positive net absorption for the year of 115,133 square feet. The overall office vacancy rate was 8.9 percent at the beginning of last year. Two of the quarters posted negative net absorption last year while two quarters were positive. At the end of the fourth quarter, 3,522,479 square feet of new office space was under construction. The average quoted asking rental rate for all classes of office product was $32.86 per-square-foot at the close of the fourth quarter. Class A space averaged $39.71, while Class B space was $27.76 and Class C space was $14.87 per foot. Total office inventory at year end was 233,380,457 square feet. compared with 2017 when 107 office buildings sold, also with total volume greater than $1.5 billion. The average price-per-foot was $215.43 in 2018, versus $213.15 in 2017. Cap rates changed little, averaging 6.81 percent last year compared with 6.72 percent during the same period of 2017, according to CoStar. Retail real estate in South Florida finished 2018 with a slightly higher vacancy rate then where it started, moving from 3.7 percent to 4.1 percent, yet overall the property sector had a good year, given the onslaught of ecommerce and its affects in other U.S. markets. For the year, 735,202 square feet of retail space was positively net-absorbed, and rental rates increased 3.05 percent from a year earlier, finishing 2018 at an average of $28.16 per-square-foot. During the four quarters last year, nearly 2.6 million square feet of new retail space was delivered to the market. At the close of 2018, approximately 5.3 million square feet of retail product was under construction, reported CoStar. Retail real estate encompasses Shopping Centers – including community centers, neighborhood centers and strip centers), Power Centers, General Retail Properties, Malls and Specialty Centers, such as outlet malls, airport retail and Theme/Festival Centers. During the first nine months of 2018, 92 retail properties were sold with a total sales volume of $1.03 billion, compared with the same period in 2017, when 80 retail properties sold for a total sales volume of $1.08 billion. Cap rates came down for retail real estate in 2018, moving from 7.07 percent in 2017 to 6.48 percent last year. Ken Morris attended the Society of Industrial and Office Realtors (SIOR) Fall World Conference in Denver, CO this past fall. With nearly 1,000 fellow SIORs and sponsors in attendance, it was excellent networking with Thought Leader breakout sessions, panels and brilliant speakers. One of the best speakers at an SIOR event in years – Four-Star Admiral and Navy SEAL William McRaven, presented the keynote address during the Friday session. 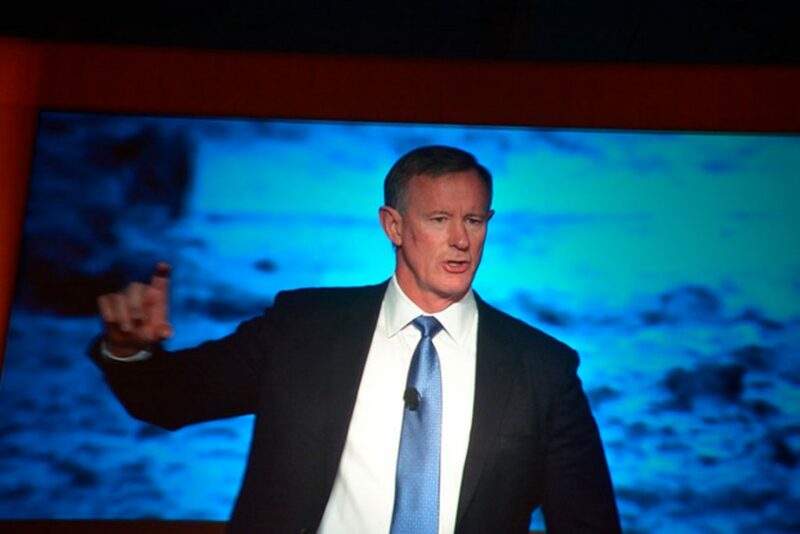 Sponsored by Prologis, Four-Star Admiral and Navy SEAL William McRaven was a special speaker for a number of reasons, among them, SIOR has been trying to get him as a keynote speaker for four years but his schedule did not allow it until the Denver conference. McRaven is credited for organizing and overseeing the execution of Operation Neptune Spear, the special ops raid that led to the death of Osama Bin Laden on May 2, 2011. CIA Director Leon Panetta delegated the raid to McRaven, who had worked almost exclusively on counter-terrorism operations and strategy since 2001. 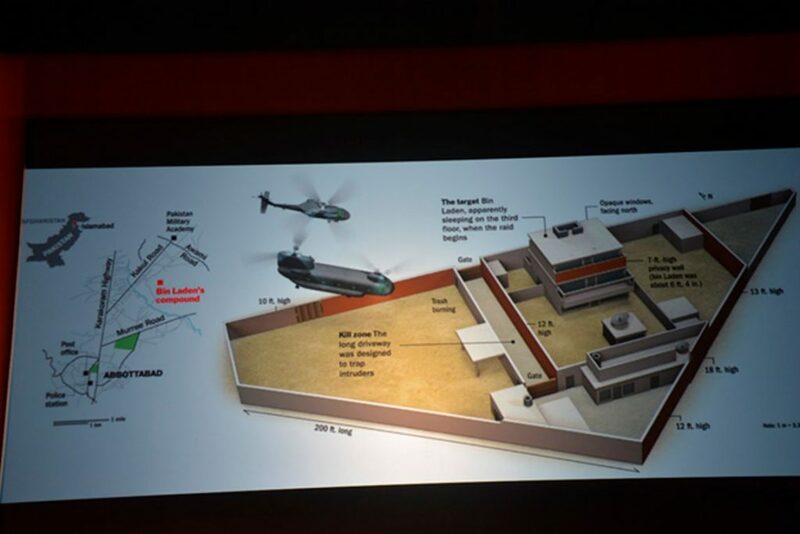 Of course the SEALs opted for the helicopter assault and SEAL Team Six executed the raid on Osama Bin Laden’s Pakistan compound, accomplishing their mission. President Obama, Vice President Biden, Secretary Clinton, Secretary of Defense Robert Gates, Chief Counter-terrorism advisor to President Obama John Brennan (he later became CIA Director) and others tracked the progress of Operation Neptune Spear with impassioned interest and concern. 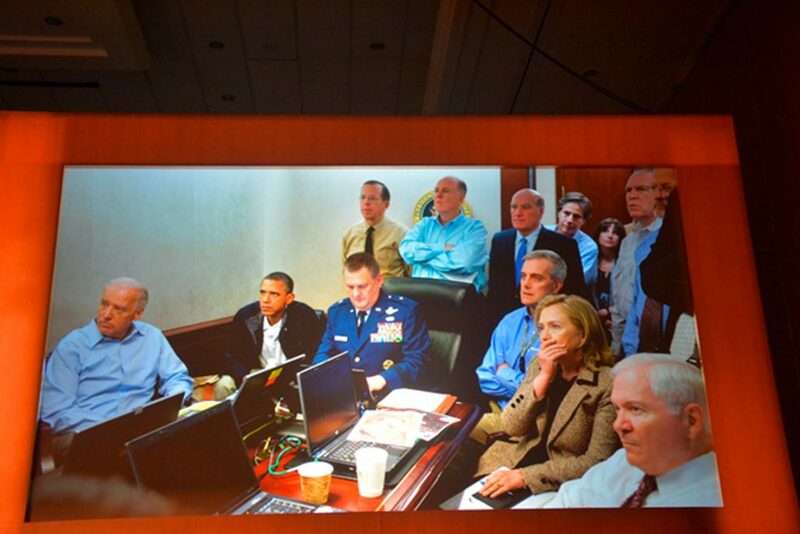 Most people believe this photo was taken in the Situation Room, but McRaven said it was not; rather, it was taken in an adjacent room of the White House. McRaven’s greatest point during his talk was on toughness, saying “training brings out the toughness in people” yet mostly, “you just don’t quit,” whether it is as a special operations warrior, or in life, sports, and business, if what you want is worth fighting for. During the Q&A with McRaven, he was asked about Millennials and the generation behind them, or young people just entering and graduating from college. He was very optimistic about this generation and expressed “great confidence in young kids today.” He reminded us that earlier generations of Americans had little faith in what the Baby Boomer generation might accomplish, and it turns out that we have done okay. Buying, selling, leasing space or do you own commercial property that requires third-party management to take care of the asset? Call Ken Morris at 954.240.4400 or email him at ken@morrissegroup.com. 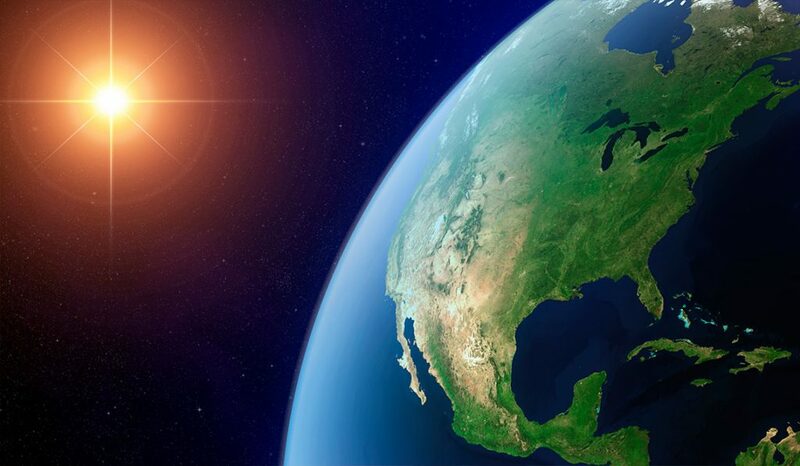 Last November, 300 scientists and 13 federal agencies collaborated to produce the latest National Climate Assessment, a congressionally-mandated quadrennial report on climate change and its expected effects on our nation and the world. The results presented a stark picture of what kind of world we may leave our children if nothing is done to change our role in this global issue. 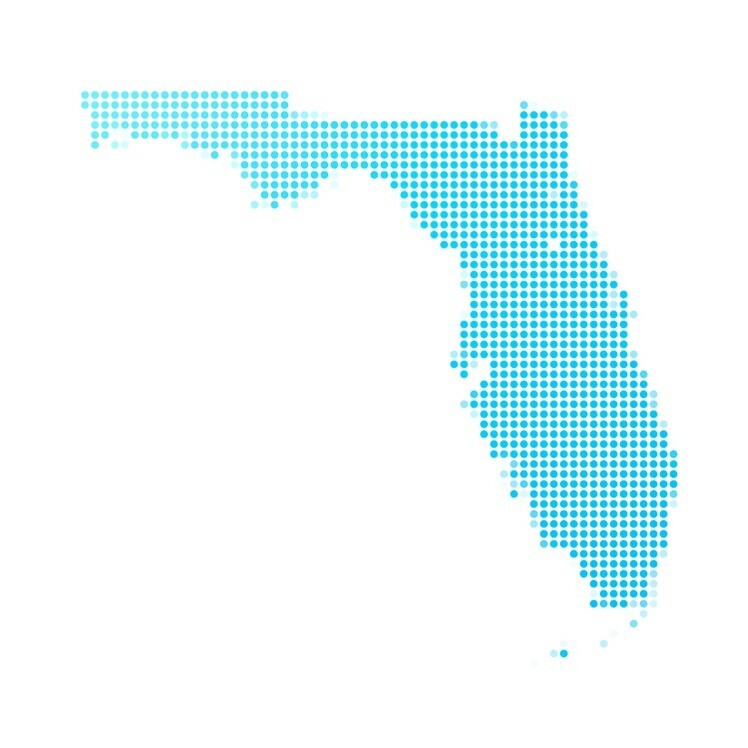 South Florida is well-known as the canary in the coal mine for how climate change may affect U.S. coastal areas, as many of the worrisome predictions in the report are already taking place here and have been for some time – rising tidal levels, hotter temperatures, potentially stronger hurricanes, increased flooding, vanishing coral reefs, and longer mosquito seasons. Luckily, the region is also known for its proactive response to this issue, particularly in the real estate market. Real estate buyers and investors are showing their concern about climate change in their purchase decisions. They want to be sure the view (and the property itself) will be there for generations to come. South Florida has shown its commitment to solving the problem and put its money where its mouth is, to the tune of $200 million dollars to counteract flooding associated with higher sea levels. The Florida Keys are preparing to spend as much as $500,000 for each mile of road that will be raised up out of harm’s way. Key structural elements of coastal cities, particularly those in South Florida, are at great risk. These include bridges, roads, transportation, and power grids. If left unchecked, sea levels could render sections of the U.S. coastlines uninhabitable. New building codes in Miami Beach that require all new construction to be elevated. A high-rise in downtown Miami designed to stand firm against 300 mph winds, a major selling point to potential buyers. Certain South Florida developers raise their property with additional soil and install high sea walls. Planning and zoning boards across the region continue to scrutinize building codes and implement proactive changes to raise height limitations for sea walls, place roads, water, sewer, and electrical systems on the higher ground, and install massive pumps to send water back into the sea. The most commonly-understood impact of climate change is on the natural world. It should, therefore, come as no surprise that the National Climate Assessment cites many environmental concerns which play a major role. 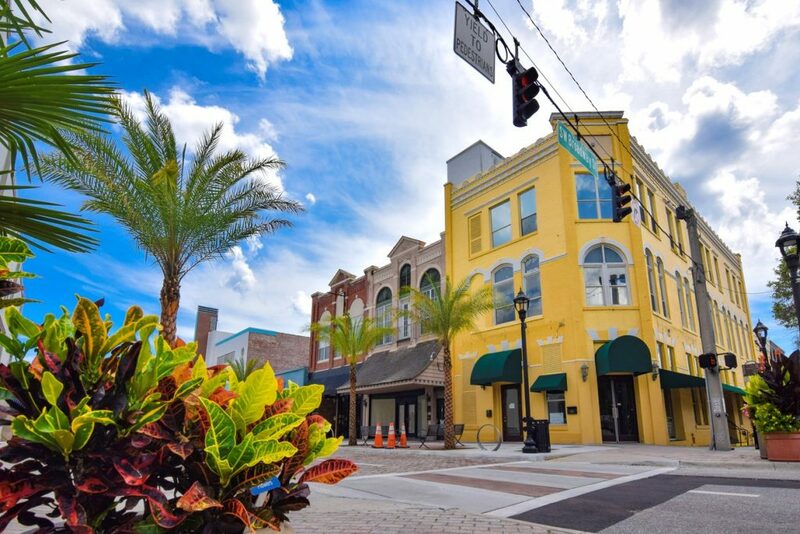 South Florida is home to a growing number of municipalities who embrace green building standards to combat climate change and support sustainability. Support from investors and property owners have spawned some significant efforts in Miami. According to the 2017 National Green Adoption Index, 12.29 percent of the city’s commercial real estate is certified as green, or 33.91 percent of total square footage in green buildings. LEED Silver Certification requirements for all new projects over 50,000 square feet. Expedited permitting for green projects and density bonuses for buildings that meet certain targets. Financing for upgrades in energy efficiency, hurricane hardening, and renewable installations. Green construction pays off not only for the environment but for the bottom line. According to Miami-Dade Green, businesses that opt to go green save 15 to 30 percent on cleaning costs, 35 percent on energy bills, and as much as 60 percent on water. Eighty-five percent of the U.S. population lived in major cities in 2015, and this trend is expected to continue well into the future. Cities are responsible for around 80 percent of greenhouse gas emissions, which gives them significant influence on local policy on how to handle the problem. The South Florida real estate market has seen opportunity on the horizon and dipped its toe into the tiny space and micro-unit movements, opening doors to a more sustainable and affordable way to live in the heart of a major city. Morris Southeast Group is certain that South Florida’s best days lie ahead, despite the challenges posed by climate change. Let us help you find the property that fits your budget and needs. For a free consultation, call Morris Southeast Group at 954.474.1776. You can also reach Ken Morris directly at 954.240.4400 or via email at kenmorris@morrissegroup.com. Is Your New CRE Opportunity in a Shipping Container? Tourists travel to South Florida because the region has plenty of sunshine. But take one look at Port Miami and it’s pretty clear there’s an over-abundance of something else: shipping containers. They’re lined up along the docks, stacked on top of one another, and suspended in mid-air as they’re loaded and unloaded each day. Where some people see something that’s completely utilitarian, others see the vast possibility for repurposing these big boxes as residential and commercial spaces. The idea of using shipping containers as a building certainly isn’t a new one. Homeowners and architects around the globe have turned to them as a practical means of home construction for years. As a result of the tiny living movement and a new environmental awareness that promotes sustainability, what was once seen as an architectural oddity has slowly gained mainstream acceptance – just do an online search to see the number of companies now specializing in shipping container conversions. In a natural evolution, though, the idea has crossed over from residential uses to commercial ones. In an area like South Florida, where there is strong competition between neighborhoods to attract residents, shoppers, and visitors repurposed shipping containers can be a sensible solution for revamping zombie properties or attracting entrepreneurs and pop-ups. Shipping containers come in a somewhat standard size. Height is either 8.5 feet or 9.5 feet, and lengths are 8, 10, 20, or 40 feet. This allows for a variety of uses, including stacking options; think of it as Legos for adults. Just like that childhood toy, the possibilities of configuring the containers are nearly endless. Single-family homes are one of the most popular uses since square footage costs run between $80 and $120. Consequently, it’s not a big leap to convert the containers into duplexes or even larger multi-family complexes. 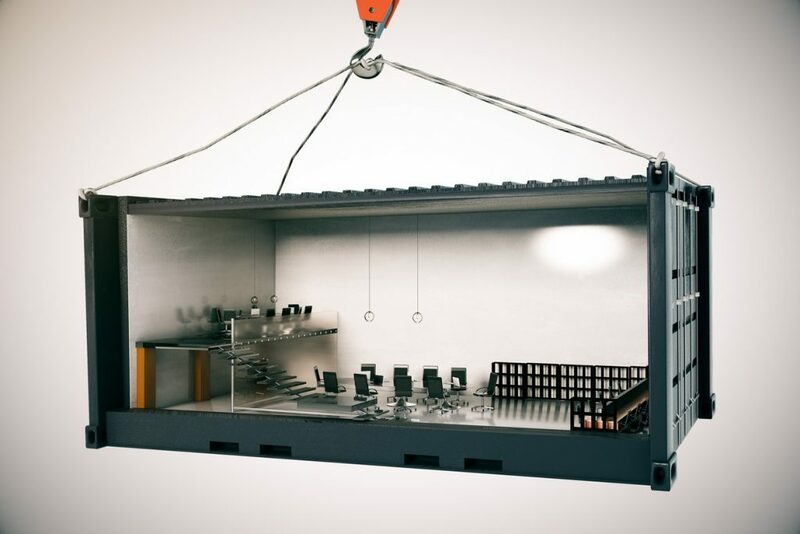 In terms of commercial space, shipping containers are able to house things like small coffeehouses or motels to healthcare facilities, office space, and everything in between and beyond. In Asheville, NC, the Smoky Park Supper Club – made from 19 containers – is currently the nation’s largest shipping container structure. Depending on the company, alterations such as window and door cutouts can occur offsite or onsite. Although the structure began life as a shipping container, its use as a building still requires that codes are followed and permits pulled. Permanent and semi-permanent codes may vary, and it’s a good idea to understand the local codes in advance to know that the intended use will be allowed. Stacking containers often has its own set of issues, such as stability and waterproofing. In the long term, shipping container conversions are less expensive than traditional brick-and-mortar buildings. They can be relocated to a new location or repositioned on the same property – all without demolishing the structure and starting from scratch. Similarly, repurposing shipping containers are better for the environment. They can be re-tasked for new projects, while rubble and debris from demolished buildings will be added to landfills. The professionals at Morris Southeast Group are excited about the possibilities borne out of the repurposing and sustainable movements. While this shipping container trend isn’t fundamentally reshaping South Florida, it does hold promise for both temporary structures that enable a quick repurposing of property, as well as more durable options that make creative, economical and environmentally-friendly use of space. South Florida’s ascent as a major player in the tech sector is highlighted by its recent inclusion in the Cushman & Wakefield Tech Cities 2.0 annual report, which documents the state of current and rising tech centers and their effect on local commercial real estate. The Miami-Fort Lauderdale-West Palm Beach market is in the “Tech is important” category, which indicates that the area has many important sectors in which tech is a growing force. There are many positive indicators pointing to South Florida – and the Miami-Dade area in particular – as a rising tech star. In 2017, Miami ranked eighth in venture capital funding among U.S. cities, bringing in $1.3 billion for local startups and placing it squarely between heavyweights Seattle and Chicago. In addition, the Miami-Fort Lauderdale area placed first for new business creation in the Kauffman Foundation’s 2017 Index of Startup Activity. This development is being mirrored in other areas of the U.S., with new tech hubs emerging in such disparate places as Philadelphia and Provo, Utah. Unsurprisingly, hiring in South Florida tech has been robust, reaching a 16-year high. The sector has grown steadily – 27.6 percent from 2012 to 2016 – and 69 percent of entrepreneurs said they planned to grow their staffs in 2018, up from 64 percent the year before. New companies and vibrant partnerships pop up regularly, including The LAB and Refresh Miami, “a community of hackers, early adopters, entrepreneurs and change artists,” in a diverse array of neighborhoods like Overtown, Coconut Grove, Brickell, and Wynwood. Neighboring Fort Lauderdale also has its fair share of tech companies, a number that is rapidly growing. The tech landscape has also branched out of literal “technology” to encompass innovative aspects of the media, law, and retail sectors, all of which have stepped up to compete for talent and space, which leads to another area affected by this boom – real estate. Of the many areas that have felt the impact of South Florida’s growing tech industry, the local commercial real estate market is one of the most significant. Starting in 2017 and continuing into the middle of 2018, the tech and life sciences industry made up 10.8 percent of all leasing activity in Miami-Dade, 5 percent in Broward, and 4.4 percent in Palm Beach. Although there are many bright spots in the region’s tech fortunes, research is not yet among them. South Florida spends approximately $565 million annually on academic research and development. While that may sound impressive, it only ranks 24th in the U.S. and 43rd when adjusted for population. One ace in the hole for South Florida is the rich diversity of its population. The local tech sector has begun to play a significant role in enabling a diverse workforce that sets it apart from the hiring issues in Silicon Valley. In addition, Miami’s lower cost of living gives it a recruitment advantage over more expensive areas like New York, Boston, or San Francisco. It has a wide pool of fields under the tech umbrella, including hospitality, travel, transportation, and logistics. And the city’s reputation as the gateway to the Americas gives it unique access to capital from that region. Morris Southeast Group is excited by this development and we stand ready to help CRE investors and companies in the tech sector meet their growing real estate needs. For a free consultation or to learn more about our property investment opportunities and/or other services, call us at 954.474.1776. You can also reach Ken Morris directly at 954.240.4400 or via email at kenmorris@morrissegroup.com. 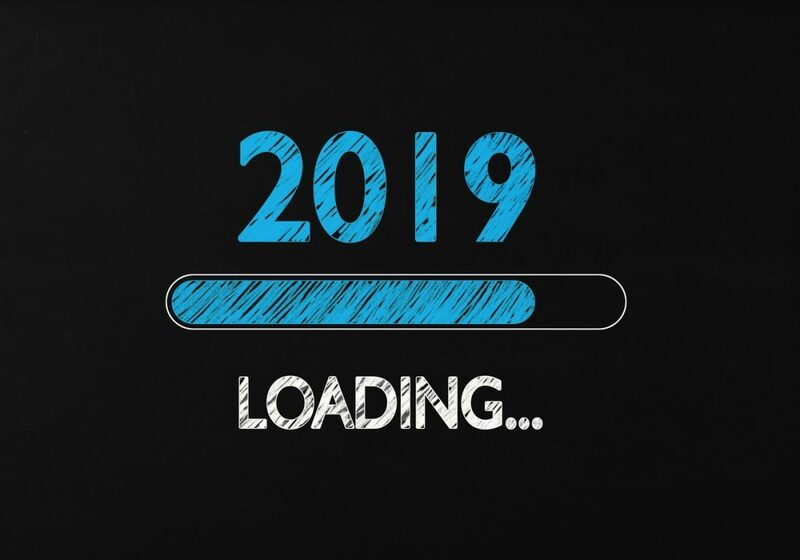 By the time this is posted, the New Year will already be weeks old – and in that time, many personal resolutions will have been tossed, amended, and forgotten. That fresh start gusto is difficult to maintain unless you have the drive and a great reason to keep it going. As much as the New Year is a time to reassess personal goals, it’s also a great time to do the same with real estate investments – including your goals for a specific property and looking at ways to increase its value. And because the added value will increase your return, property resolutions may be a whole lot more successful and easier to measure than the personal ones. 1. Is it time for a facelift? Cosmetic changes to property generally come in two sizes: great and small. They can range from improved security measures or new exterior paint to a remodel of the lobby or a completely new facade. They can also be as simple as new landscape plantings and lighting, or even getting creative with local artists – and in a place like South Florida, these last three items can go a long way. In examining previous operating expenses, there may be a few areas where money can be saved. Two major ones that can be addressed are electric bills and water usage. Switching to energy-efficient bulbs and replacing windows could lower monthly electrical bills, while changing out flush valves on commercial toilets can mean water savings without replacing the fixtures. It’s also better for the environment, and this, in turn, is more attractive to the mindset of many of today’s tenants. This third item goes hand-in-hand with number two. Most tenants understand that they will have to pay for utilities, and for many, the monthly total is divided up among all of the tenants. By installing a sub-metering platform, however, each tenant will have his or her own meters. This makes tenants responsible for managing their own utilities rather than an average by square footage based on the entire building – and this can be a huge selling point for prospective tenants who are looking to control costs. Neighborhoods always seem to be changing, especially in fast-growing South Florida. What was once an industrial area becomes an arts center, and then that may transform again into retail and residential. If the neighborhood in which a property is located is becoming something other than for what it was originally zoned, then perhaps it might be time to get a zoning variance so the property can keep up with a changing location. The quickest way to raise value is to raise rents, but there really needs to be an asterisk next to this final suggestion. Before upping the rent, it’s important to look at the data on the property, as well as that of surrounding properties to discern whether or not your tenants are paying a market rate and if there is even the potential for a reasonable increase. A great way to make an increased rent more palatable for a tenant is to have it specifically reflect tangible improvements made to the property. When coming up with property resolutions for the coming year, it’s important to remember that you’re not in this alone. The Morris Southeast Group team is skilled at not only property management but also help you devise ways to make your property achieve the most value. Can Tiny CRE Be Big In SoFlo? For several years now, many Americans have had a love affair with the small things in life. Families and millennials embraced smaller homes and micro-units as a means of living affordably in the wake of the Great Recession, of embracing efficient and sustainable ideas, and of simply owning something. Whatever the reason, micro-living represents a popular shift in the collective mindset. 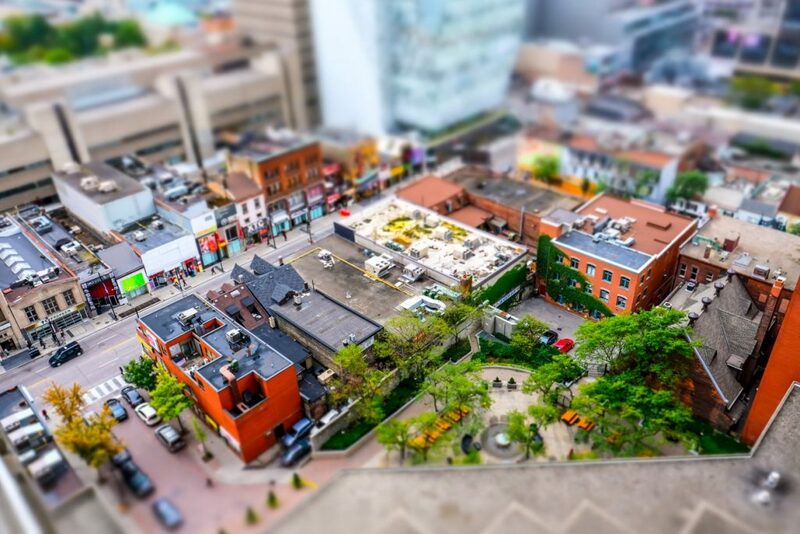 It was only a matter of time before some entrepreneurs and CRE developers, investors, and business owners also embraced the Lilliputian life. In cities across the country, small and awkward spaces – once seen as empty in a bigger-is-better world – are literally getting a new lease on a profitable life. The small space CRE movement is a natural byproduct of cities across the country creating high-density, pedestrian-friendly neighborhoods – very much like the building boom along Fort Lauderdale’s Las Olas Boulevard. The results are that space is at a premium, parking is limited, businesses must rely heavily on foot traffic, and residents require a variety of convenient services. For the owner/investor, that spells opportunity. A BISNOW article on the tiny boom mentions the CBS sitcom Two Broke Girls, in which two waitresses made a deal to convert an old supply room behind their dinner into a small cupcake business with a sidewalk window. That may be fiction, but many entrepreneurs are using similar tactics – and many of the new multipurpose ventures are giving small a big name. Clearly, not every small space will double as a gourmet cupcake shop, but looking to repurpose unused, underused, or vacant small spaces requires a degree of similar creativity. You have to understand what local consumers need, reach out to the right entrepreneurs, and think outside of the box (store, if you will). A current tenant may want to try a new venture on a smaller scale, while a new business might be eager to get a foothold in a high-rent area without the astronomical overhead of a dedicated space. It could also mean bringing several small boutiques together under a single roof in a micro-mall located in the shell of a brick-and-mortar space or, as in Miami’s Upper Buena Vista, under the canopy of some magnificent trees. At the same time, larger brand names – Nordstrom and IKEA, to name two – are expanding into smaller spaces to meet the changing demands in the retail market. Normally located in malls, box stores, and any location that requires a car to get there, these big-things-in-small-packages venues allow these national retailers to reach the new urban dweller. These smaller locations provide more limited merchandise as well as an opportunity for customers to interact with store personnel, ask questions, and then place an online order to be picked up at the same location. At the end of the day, efficiency, convenience, and ROI are necessary to make tiny CRE a big success. Those three values are also at the heart of Morris Southeast Group as our professional team works to make big CRE goals come true. For a free consultation or to learn more about our property investment opportunities and/or other services, call us at 954.474.1776. You can also reach Ken Morris directly at 954.240.4400 or via email at kenmorris@morrissegroup.com. Florida and railroads seem to go hand-in-hand. It was, after all, Henry Flagler’s vision and money that extended rail down the east coast of the peninsula and helped turn South Florida into South Florida with a capital “S.” With the completion of that essential mode of transportation, developers, investors, and residents soon flooded the state and transformed the land of sun and sand. New forms of rail are being looked at as a potential solution for moving a huge number of people and easing the state’s growing traffic congestion problem – while also inviting development and investments. Complicating this effort is a complex debate, as rail also happens to be one of the most hotly-contested topics when it comes to city planning. Tri-Rail, which was authorized by the Florida Legislature in 1989, has been the single link for commuters and tourists traveling between the state’s three most populated counties. Then came talk of a high-speed rail line to link South Florida’s major hubs with Orlando – and Brightline was born. It’s been a rocky road for the line. Priding itself on speed, comfort, and cleanliness, Brightline also comes with a hefty price tag that includes an expensive fare for riders and a list of unexpected fatalities. Brightline was not cited in the deaths, however, and more than half were ruled suicides. Despite these early challenges, many investors are maintaining a positive feeling toward the opportunities the rail service can bring. 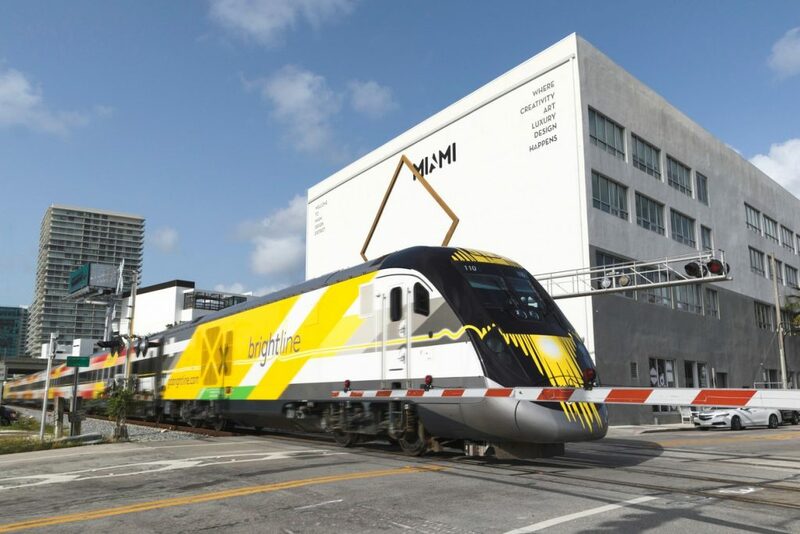 Development projects continue to line up in close proximity to Brightline’s three stations, located in West Palm Beach, Fort Lauderdale, and Miami. All three downtown areas are looking at new residential, retail, and office expansions. The latest news has Brightline partnering with Richard Branson’s Virgin Group. The rail service’s new name will be Virgin Trains USA. In addition, the new brand filed with the Securities and Exchange Commission to become a publicly-traded company. With two north-south rail lines now operating, next comes the question of how to move people east and west or even how to bring them to other major areas of the cities. For example, once a traveler arrives at one of the three Brightline stations, they now have to rely on walking, rental cars, public transportation alternatives, or a ride-sharing app to further navigate each region. This, in combination with expanding downtown areas, has city officials and developers looking at light rail systems. In Fort Lauderdale, that meant The Wave. And, yes, that’s past tense because, in May 2018, the whole plan collapsed. Critics argued the idea was obsolete before it even broke ground, saying that travelers would more likely use ride-sharing apps or driverless vehicles. There was also concern the system failed to connect downtown with the airport and seaport. Developers had been counting on the rail system, which would have linked key areas of the city’s downtown. In fact, many of the projects, already begun before the rail project was nixed, were located near planned Wave stations. Nevertheless, developers remain positive that the loss of The Wave will not deter an expected population surge; it just means a greater strain on the current public transportation system and overly-congested roadways. Meanwhile, Miami has had a 16-year light rail fight on its hands. The battle began in 2002 when a half-cent sales tax was instituted to extend the Metrorail system into south Miami-Dade. The money, however, was redirected to the Miami-Dade bus system. In September 2018, a vote by the regional Transportation Planning Organization provided support for the county’s bus rapid transit system or BRT. The line will provide a linkage via US 1 to Florida City. Rather than rail, a new fleet of buses with doors wide enough to allow multiple passengers to enter and exit would operate on 20 miles of existing, dedicated bus lanes. Fourteen stations along the route would provide services. For as long as trains have been traveling down the Florida peninsula, so to have developers and investors. It’s unfortunate that so many ideas seem to be bogged down in battles, whether the proposed public transit system operates on rail or rubber. The idea is to think and move forward to solve SoFlo’s transportation issues. Fortunately, South Florida’s culture and climate remain an attractive lure for many, and development is following suit. For a free consultation or to learn more about Morris Southeast Group’s property investment opportunities and/or other services, call us at 954.474.1776. You can also reach Ken Morris directly at 954.240.4400 or via email at kenmorris@morrissegroup.com. If those walls could talk, would they tell you landmark status is profitable? When it comes to CRE investments, there’s a niche market filled with challenges and rewards that can be intimidating to some and thrilling to others: owning a landmark property. Very often, historic landmark properties tend to be residential ones, typically a free-standing home. In recent years, perhaps as a pushback against development, multi-family, and commercial properties, as well as entire neighborhoods, are using national landmark status as a means of preserving the culture, appearance, and/or significance of a region. The property owner – or, in the case of districts, the local government, local preservation board, or homeowner’s association – is responsible for filing the application, which can take anywhere from four months to a year to be approved. The property owner must give permission for his or her building to be listed as a historic property, so this process can never be done behind the owner’s back. Needless to say, owning or investing in a landmark-listed property presents a unique set of challenges. At the top of the list is the ability – or freedom – to renovate the structure, particularly since there are certain Americans with Disabilities Act (ADA), energy-efficient, electrical, and structural standards that must be met. Landmark applications shouldn’t be made until after renovations are complete, and many owners worry that their hands will be tied. Those worries can be eased, however, with the understanding that whatever it is about the building that makes it historic must be preserved. This is truly a labor of love. There may need to be negotiation with and approval from local historic boards or municipalities, but renovations can certainly receive a green light. For the investor who wants to own a piece of history, there are benefits to landmark property status. For starters, most structures are located in historic districts which are usually in the heart of cities. Very often, this location means massive foot traffic for tenants. At the same time, there’s also the prospect of developing a reputation as an investor who cares about the community in which the building is located. That alone can help attract prospective commercial and residential tenants. Then, there is a tax incentive. An income-producing property that is listed or is soon to be listed on the National Registry is eligible for a 20% federal rehabilitation income tax credit. The property must retain enough materials and historic characteristics for it to be eligible. Morris Southeast Group has been serving the community since 1976. We know the neighborhood treasures and the hidden gems that not only hold potential, but also have a historic tale to tell – one that provides benefits to owners, tenants, and the public when this history is preserved. Is There Room For Self-Storage Investment In SoFlo? Any talk of commercial real estate investments is usually about retail and office spaces, industrial facilities, and multi-unit residential properties. There is, though, another niche CRE market that’s figuratively and literally full of possibilities: self-storage. 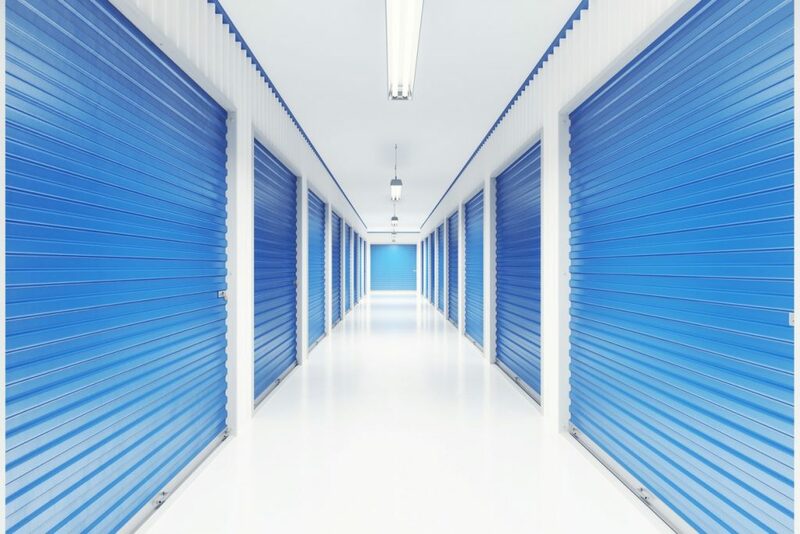 A recent list of the top 10 self-storage markets to watch has South Florida at number 8, and for some very good reasons: properties that are currently available, population, new growth centers, and, of course, the human need to hold onto stuff. In a sense, the demand for self-storage in South Florida is a bit like the perfect storm. For starters, a large proportion of the population lives in residences that provide very little in-house storage. These properties run the gamut – from rental properties or condos to old-Florida homes or luxury hi-rise units. There’s also the matter of demographics. At the top of the list are aging Baby Boomers, many of whom retire and head south to start a new life chapter in Florida. What many discover, though, is that despite their downsizing from their previous residence, they still have lots of stuff – collections and sentimental possessions – that won’t fit into their new location. Similarly, Millennials and younger individuals tend to rent in bustling downtown hubs, where units are small with very little storage. As they acquire things and move to different-sized units, some items need to be stowed away for another day. For the investor, self-storage can potentially lead to a steady income stream. Very often, self-storage facilities do not require the same amount of maintenance as a more traditional CRE space. Additionally, the average stay in a self-storage unit is one to three years. With proper management and knowing the market, it’s possible to maintain a stable occupancy which can lead to a steady 8% to 10% return. Despite the South Florida region sitting at #8 on a self-storage markets-to-watch list, there are still some things to consider. Some investors believe the time to have entered the market was immediately after the Great Recession when many homeowners lost their homes and a lack of storage space created a definite need. At the same time, experts estimate that developers will complete approximately three million square feet of self-storage in South Florida in 2018. The increase in development means that there are higher vacancies, which in turn leads to lower rents. As with any CRE investment, it’s imperative to know the market. Despite the challenges above, some developers are giving self-storage a whole new look in order to meet the changing demand. The market, it seems, has niches within its niche. Self-storage occupants tend to live within a 1 to 5-mile radius of their storage unit. As more people opt to live in storage-limited residences in downtown areas, some developers are transforming storage facilities from rows of garages to something that looks more like a stylish office building and locating them within the community rather than on the fringes. It’s becoming more common to see multi-use building plans also include a portion of the construction dedicated to self-storage. New projects are also racing to offer clients new perks, such as larger spaces for maneuvering bulky furniture, environmentally conscious climate controls, music, and brighter lighting. Perhaps the most niche-specific self-storage unit in the area is The Collection Suites in Doral, a facility for car-enthusiast residents of luxury condos in Miami who are in need of additional parking spaces. Founded in 1976, Morris Southeast Group knows South Florida, its neighborhoods, its needs, and its CRE trends. For a free consultation or to learn more about our property investment opportunities and/or other services, call us at 954.474.1776. You can also reach Ken Morris directly at 954.240.4400 or via email at kenmorris@morrissegroup.com. The commercial real estate (CRE) marketplace can, for some investors, seem like a very intimidating world. Properties, regulations, and legal intricacies are plentiful – and so an individual will most likely want to develop a relationship of trust with a CRE agent. Unfortunately, selecting the right agent can be just as intimidating. 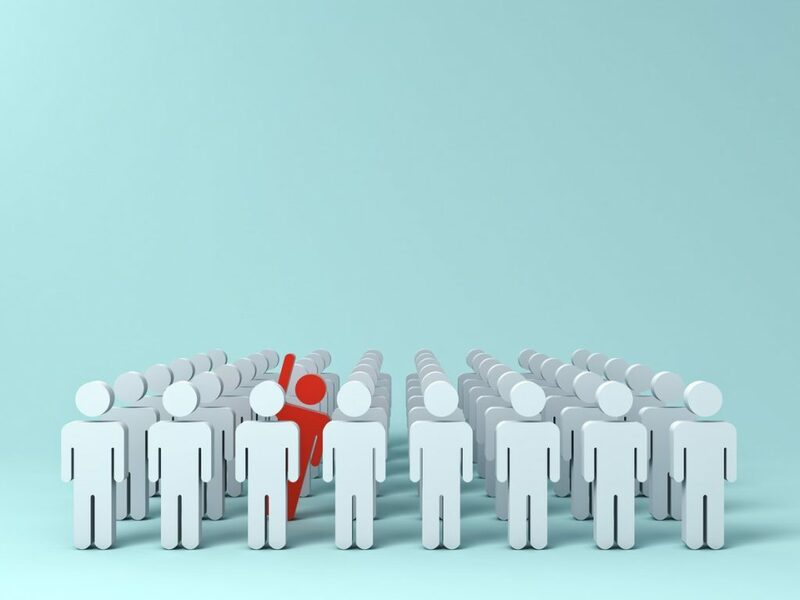 Unlike doctors and lawyers, there is no highly-specific, legally-mandated designation for an individual to practice commercial real estate – and that’s why professional organizations are key to establishing a standard of practice and designating a professional’s success in meeting those standards. The Society of Industrial and Office Realtors, or SIOR, is one such professional organization. As an affiliate of the National Association of Realtors (NAR), SIOR has committed itself to maintain the highest professional and ethical standards in the CRE industry. At present, the organization has more than 3,200 members around the globe. As part of its mission to uphold these standards, the organization established a designation as a means of not only rewarding those professionals who have worked rigorously to meet SIOR’s rigorous requirements for entry, but to also serve as an indicator to clients that an agent has gone far beyond others in that field. Not every CRE agent is a member of SIOR. That honor belongs to a select class of professionals who have made a commitment to better themselves and the industry. To considered for entry, eligible candidates must have a minimum of five years experience in the field, with a proven significant level of deal volume. After applying, the real estate professional then embarks on a series of SIOR-established goals, including classes on finance and a heavy emphasis on ethics – obtaining endorsements from other SIOR designees is necessary to complete the process. The agent has a proven reputation as a deal closer. 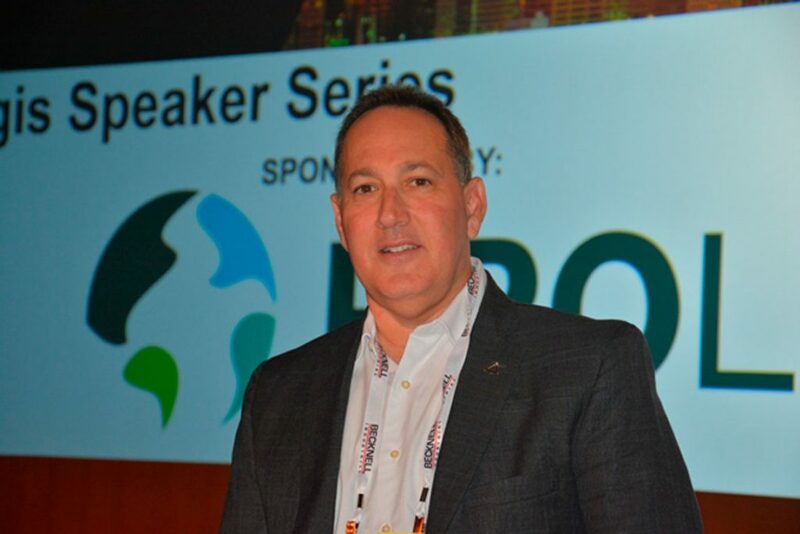 Ken Morris, the President of Morris Southeast Group, is proud to be among the two percent of real estate professionals who have achieved and received the SIOR designation. His commitment to industry professional and ethical standards has elevated his team to reach for those same goals. The result is seen each day in the relationships with long-term and new clients. Get valuable information and listings directly in your inbox once a month.